The Optoma GT1080Darbee is a fantastic gaming projector that finds a great balance between price, image quality, and portability. There are plenty of wonderful projectors on the market, but finding every feature you want in one package can be a monumental task, especially if budget is a concern. If you want to add good gaming performance to your list, your search narrows even further. Thankfully, Optoma is here with a veritable silver bullet in the form of the GT1080Darbee projector. It’s short throw, which means you can fit this projector into a small room and still get a really big picture. The color reproduction, contrast, and black levels are all good enough to impress most users, and the size is small enough to be portable. It’s not perfect, but we were impressed by its performance during testing. The first thing we noticed about the Optoma GT1080Darbee upon arrival was how small it was, measuring 12.4 x 8.8 x 3.5 inches (HWD). Everything from the box it comes in, to the provided carrying case is fairly slender. This might not be the main deciding factorfor a lot of people shopping for gaming projectors, but if portability and size are important to you, this is certainly worth noting. The top of the device features a keypad, containing two rings. The outer ring contains Info, Power, and Menu buttons, as well as the top IR receiver for the remote control. The inner ring contains four directional buttons which are used for navigating menus, but also contain split functionality that allows users to change source, re-sync, or correct keystone without navigating into the menu system. On the very inside of this ring is the Enter button. Finally, on the top front of the device near the lens is the focus ring. As for ports and connectivity, you get a 12V trigger (for electronic screen control and more), a 3D Sync Out, two HDMI ports (one with MHL support), a USB-B mini port (for firmware upgrades), a 3.5mm audio out aux port, and a 5V/1A USB power out. Check out our guide to the best mini projectors you can buy today. In the box, we received a remote control, documentation, the power cable, an HDMI cable, a lens cap (already attached to the body of the projector), and a carrying bag. Not exactly packed with accessories, but it’s everything you should need to get started. Before you begin using the device, it might be a good idea to familiarize yourself with the mounting and placement guidelines in the manual. Optoma doesn’t recommend tilting the device more than 15 degrees in either direction, and advises against using the device on its side as well. Optoma equipped the projector with “elevator feet” that can be unscrewed to raise the tilt of the projector. Above all else, make sure the projector has adequate clearance on all sides. Projectors generate a lot of heat, so excess heat will dramatically reduce the life of the lamp. Since this particular lamp’s replacements cost $179 (and can be a bit of a pain to shop for), it’s definitely worth taking a few extra steps to ensure a longer lamp life. If anything does happen to your lamp in the first 90 days of purchase, you are covered under Optoma’s warranty, however. Assuming you have a suitable projection surface, this projector will make it very easy to host movie nights with a large crowd. Power the Optoma GT1080Darbee on by pressing the button on the projector itself or by using the remote control, and follow the initial prompts to begin using your device. You’ll be asked to select a preferred language, and choose your projector’s orientation (front low, front ceiling, rear low, rear ceiling). As long as you have a source connected by this time, you should be good to start using the device right away. One interesting feature that Optoma included is a wall color function. Users projecting straight onto a wall might want to experiment with this feature. The function includes blackboard, light yellow, light green, light blue, pink, and gray options to compensate for those wall colors and balance the color more accurately. Lastly, users that wish to ceiling mount their projector should note that they need to use a mount kit that uses M4 screws with a minimum screw length of 10mm. Optoma unsurprisingly recommends using their own ceiling mount, but there are plenty of compatible mounts on the market for buyers to consider. The main feature for the Optoma GT1080Darbee is definitely its short throw, which allows you to get a fairly large screen size even if you don’t have a lot of space to work with. What governs the throw ratio is the relationship between the distance to the display surface, and the width of the projected image size. Basically, this governs how large of a screen size you can get based on how far back you can put your projector. Optoma has a handy screen size calculator to help you determine the right placement of the projector for your living room. A throw ratio of 0.49 means that the projector can achieve a 140-inch screen size from just five feet away. This was certainly the aim when Optoma created this projector — a massive screen size even in a small living room. In fact, when we first turned the GT1080Darbee on, the screen covered the entire wall, part of the ceiling and floor, and part of the surrounding walls. Long story short, projector throw ratio is a big deal, so make sure you do the math on the projector screen size and distance from your screen before you make your purchase. A throw ratio of 0.49 means that the projector can achieve a 140-inch screen size from just five feet away. While the throw ratio might be fantastic, one thing this projector lacks is a physical zoom. Many projectors are equipped with a zoom lens that generally gives the user around 20 percent flexibility on the screen size, which can be very helpful when trying to fit the image onto a projector screen. In lieu of optical zoom, the Optoma has a zoom-in functionality in the menu, which does let users shrink their image down to fit a screen, as well as edge masking functionality to eliminate overthrow. While this is certainly useful, we’d have preferred to have a real zoom. 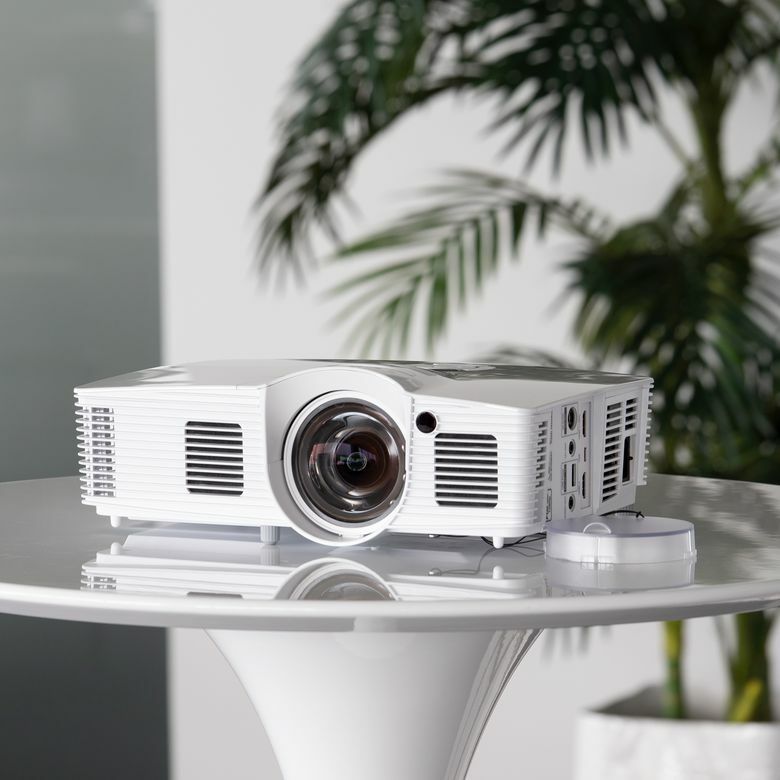 The Optoma GT1080Darbee also doesn’t have horizontal keystone correction, which means you will need to position the projector directly centered with the projection surface. It does, however, have up to 40 degrees of vertical keystone, which means you can position the projector fairly low or high and still achieve a level picture. As mentioned previously, the Optoma GT1080Darbee’s 0.49 throw ratio means you can achieve a screen size of 140 inches with just 5 feet between the projector and the projection surface. At the end of the day though, the maximum resolution supported by the device is still 1920 x 1080 at 60Hz (and 1280 x 720 at 120Hz), so users will want to find an acceptable balance between screen size, distance from screen, and resolution. A 140-inch screen from 5 feet away already give you very big pixels, so keep this in mind when planning placement. If you have a dark, classic home theater setup the Optoma GT1080Darbee will perform admirably — we found excellent contrast, color, and black levels in ideal viewing settings, even at very large (100-inch plus) screen sizes. Optoma rates their projector at 3,000 lumens (a measure of brightness), but users trying to achieve a desirable picture will only be able to do so at considerably less light output. Essentially, you should not expect to use this projector in rooms with more than mild to moderate amounts of ambient light. Users who wish to use the projector during daylight conditions will benefit from moving the projector closer and aiming for a more modest 50-65 inch screen size. The portability of the Optoma GT1080Darbee does make it a really good candidate for outdoor movie nights. Assuming you have a suitable projection surface, this projector will make it very easy to host movie nights with a large crowd. The only limitation will be sound — you will absolutely want to find external speakers if you want to use the device outdoors. At a rated 16ms of input lag, gamers won’t have to sacrifice competitiveness when playing faster paced, more demanding games. This projector really shines when it comes time to play games. At a rated 16ms of input lag, gamers won’t have to sacrifice competitiveness when playing faster paced, more demanding games. This is a really strong selling point for this projector, as a lot of home theater projectors can introduce enough lag to start being noticeable when playing games. During gameplay, we were pleasantly surprised by how responsive everything felt, and we imagine anyone shopping for a projector with gaming in mind will be very satisfied with the results. One of the downsides of the Optoma GT1080Darbee however, is that it does not have the fastest color wheel compared to other DLP projectors in this category. This means that you might notice a rainbow effect during certain situations and color reproduction won’t be class-leading. The rainbow effect (a visual artifact exclusive to single-chip DLP projectors) tends to be an extremely subjective phenomenon, with some users immediately noticing it, and others not noticing it at all. Nevertheless, if you happen to know yourself to be a person in the former camp, you should take note and evaluate accordingly. As for picture modes, the Optoma GT1080Darbee gives you the choice between Cinema, Vivid, Game, Reference, Bright, User, 3D, ISF Day, ISF Night, and ISF 3D modes. Users playing games on the projector will, predictably, want to choose the Game mode, as it not only tunes the brightness and color for games, but also guarantees the lowest input lag of all the modes. Vivid mode is a secondary choice for gaming, giving your richer colors and more saturated images. The speakers on the Optoma GT1080Darbee are certainly nothing to write home about. They are loud and clear enough to provide sound for a small room, but not much more. Audiophiles will want to shop around for external speaker solutions. The Optoma GT1080Darbee contains a myriad of menu options that will provide ample control for the image calibration gurus at home. The menu structure itself is simple enough to follow that this won’t be an overly ambitious endeavor. The color settings, in particular, are fairly exhaustive, featuring BrilliantColor (color processing algorithm based enhancements), Color Temperature, Color Matching, RGB Gain/Bias, and Color Space options. For more basic adjustments, users also have access to standard brightness, contrast, sharpness, color and tint sliders. At an MSRP of $749.99, the Optoma GT1080Darbee is not a budget projector, but for the price, you get an extremely complete offering, tailor-made for home gaming and entertainment use. If you want a sharp projector with good color reproduction, a small form factor, low latency, and a massive screen size from only a few feet away, this is about how much you should expect to pay. The closest competition, particularly in the gaming-focused space, is the BenQ HT2150ST. Both of these projectors are very capable, and fall in similar price brackets, but they differ in a few key areas. The Optoma wins when it comes to throw ratio (0.49 vs BenQ’s 0.69) and physical dimensions (The GT1080Darbee is significantly smaller). Optoma also edges out the BenQ on price ($50 less at MSRP, sometimes up to $100 less at some vendors). That is where the advantages stop, however. BenQ beats the Optoma on overall image quality. Utilizing a 6x speed RGBRGB color wheel, the BenQ HT2150ST delivers much better color accuracy and eliminates the perception of the rainbow effect for most users. The Optoma GT1080Darbee has been a popular favorite among gamers ever since it was released, and with good reason. One of the best short throw lenses on the market, extremely low latency, and a small design make this projector a great option for buyers. At an MSRP of $749, this may not be the cheapest projector on the market, but you will have a very difficult time finding another that checks all of the same boxes for less. Product Dimensions 8.8 x 12.4 x 4 in.